"This is great as a side dish or as an appetizer. 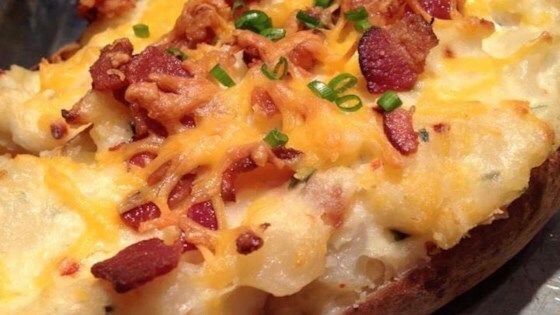 Melted cheese and crumbled bacon are the highlights of the flavorful, creamy filling." Preheat oven to 400 degrees F (200 degrees C). Use a fork to pierce the potato skins. Bake the potatoes unwrapped for about 1 hour, or until soft, in the preheated oven. Over medium-low heat melt the butter in a large saucepan. Combine onion, mushrooms, red pepper, garlic powder, pepper, chives and salt. Cook slowly, stirring occasionally until the onions are soft. Slice open the baked potatoes and, keeping the skins intact, scoop the insides into a medium bowl. Transfer the onion mixture to the bowl. Mix in the sour cream. Pour in 1/2 of the cheese and continue mixing until all ingredients are well blended. Using a large spoon, fill the potato skins with the mixture. Top with bread crumbs, the remaining cheese and bacon. Return the potatoes to the preheated oven and continue baking for about 15 minutes, until the cheese is melted and the filling is slightly brown. Outstanding baked potatoes, even if you leave out the red pepper and the mushrooms, as I did. Thanks for sharing Jamie. Best twice baked taters I have ever had!! Needed to reduce the red pepper though...too much for our taste.